2019 Toyota Corolla Hatchback Pros and Cons: Why (Not) This Car? The big question: why would someone buy the new Corolla Hatchback instead of a Honda Civic? I set out for the Honda dealer because I'd previously only driven the Civic sedan, and the hatchback has slightly different suspension tuning, but a funny thing happened on the way. I dropped by a Mazda dealer and discovered that they already had the redesigned-for-2019 Mazda3. So...why buy a Corolla Hatchback instead of the Civic or the new Mazda3? Caveats: I still haven't driven the non-R Civic hatchback, so my impressions are based on the less sportily tuned sedan. The Mazda3 was also a sedan, and one fitted with the newly optional all-wheel-drive. Good styling and materials for the class--just not the best. Why the 2019 Toyota Corolla Hatchback? For just about any Toyota the top reason to buy the car is reliability. Hondas and Mazdas tend to be quite reliable, but no make is as consistently reliable for ten-plus years of ownership as a Toyota. My only area of concern, which also applies to the Civic: the Corolla Hatchback has a CVT (bulley-and-pulley-type continuously variable transmission) instead of a conventional automatic. It's too soon to tell whether Toyota's CVT will prove durable for a decade-plus. The Civic has a second area of concern for those who keep their cars for a very long time: its engine is turbocharged. The new Mazda3 will eventually receive an innovative new engine. But for now it's fitted with essentially the same engine and transmission it's been using since 2014. Not only should the Toyota Corolla Hatchback cost less to own over the really long haul, but it also costs less up front. Like the Scion it replaced, the Corolla Hatchback includes a lot of standard content at a very competitive price: $20,920 for the SE and $23,920 for the XSE. Add $1,100 for the CVT. Compared to a Mazda3 hatchback, the Corolla Hatchback costs as much as $2,500 less. Add features and / or move up trim levels, and the cost difference varies from $1,100 to $3,400, but adjusted for feature differences remains about $2,000. Compared to a 2018 Honda Civic LX hatchback, the Corolla Hatchback costs about the same...but includes additional standard features worth about $4,000. Civics actually become better values when loaded up. Compare the top trim levels and the Toyota costs about $3,000 less, but the Honda includes nearly $900 worth of additional features, for a feature-adjusted price difference in the low 2000s. Short rear overhang good for styling, but not for cargo room. There might be a theme here. Not only does the Toyota Corolla Hatchback cost less to buy and (likely) to keep up for ten-plus years, but it also costs less to feed. The SE and the CVT achieved 32 mpg city, 42 mpg highway in the EPA's tests. The XSE, probably due to 18-inch rather than 16-inch wheels, scored a little lower, 30/38. With a manual transmission both trims are rated the same: 28/37. Available only with what used to be the larger of two engines, a 2.5-liter four-cylinder, the Mazda3 isn't in the same ballpark when comparing two-pedal cars: 26/35. It comes closer with a manual transmission, 25/35, mostly because the Corolla Hatchback (in either trim) scores much lower when fitted with a stick shift than with a CVT. Then there's the Honda Civic hatch, which leverages turbocharging to test nearly as well as the Toyota with a CVT (31/40) and actually manages to claim the manual transmission efficiency prize (29/38). In my driving, the Corolla Hatchback's trip computer average could be coaxed above 50 mpg. But when driven somewhat enthusiastically in the suburbs low 30s happened. On the highway I observed a trip computer average just above 40, close to the EPA rating. The Toyota Corolla Hatchback's impressive standard content includes a nearly full array of collision avoidance technology (forward collision warning, automatic braking, lane departure warning, lane departure prevention). Plus adaptive cruise control that with the CVT includes stop-and-go capability. Plus automatic high beams and rain-sensing wipers. Blind spot warning and an OnStar-like telematics system are part of a $1,400 option package on the SE (only offered with the CVT) and standard on the XSE. Both Honda and Mazda have been offering similar safety technology lower and lower in their ranges. For 2019 Honda's safety suite (which doesn't yet include blind spot warning on its smaller cars) is standard on even the least expensive Civic. Mazda hasn't gone quite this far yet: all but the base sedan of the new Mazda3 get its safety tech, including blind sport warning. All three auto makers should be commended for making safety and convenience technology that was only offered on expensive cars just a few years ago standard on cars with prices in the low 20s. Even the Corolla Hatchback SE is fitted with an eight-inch infotainment touchscreen with knobs for BOTH volume and tuning. The latter is a bit of a reach, but overall the controls are laid out well and intuitive to operate. The infotainment system itself isn't the quickest-responding or the most sophisticated, and buyers into the latest tech might mind this. Like the Germans luxury makes, the Mazda3 uses console-based knobs rather than a touchscreen. This setup works at least as well as that in the Toyota, though tuning can require some clicking and scrolling to get to the correct screen. Honda provoked an uproar when the 2016 Civic's infotainment system had no knobs. My solution: I actually used the volume control on the steering wheel (something I've rarely done in other cars). For 2019 they've added a volume knob. Maybe they'll add a tuning knob next year. Why Not the 2019 Toyota Corolla Hatchback? I prefer my instrument panels compact. Make them tall or deep, and I feel less connected with whatever's going on where the rubber meets the road. The instrument panel in the Toyota Corolla Hatchback is both tall and deep. This is easily my least favorite aspect of the car. The new Mazda3's instrument panel is more compact than the Toyota's, but not by a large enough amount to make me happy. Mazda could also do better. The Honda Civic scores a clear win in forward visibility. After fitting two generations of Civics with massive instrument panels, Honda took a jump in the right direction with the 2016 redesign. The current Civic's instrument panel is much lower than those in the Toyota and Mazda. The Scion iM / Toyota Corolla iM was engineered primarily for the European market on a totally different platform than the Toyota Corolla sedan. The 2019 Corolla Hatchback shares a new platform with the 2020 Corolla sedan (and with the new Camry and Avalon as well). But it's still a smaller car than the Corolla sedan, with a wheelbase shorter by 2.4 inches. This somehow translates to a foot less rear legroom on the spec sheets, a tremendous difference. Toyota seems to cheat the sedan's legroom specs by a couple of inches--but ten inches is still a huge difference. Aside from the lack of space, the Corolla Hatchback's rear seat cushion is higher offer the floor than the Civic's and provides decent thigh support. On paper, the new Mazda3 offers about five inches more rear legroom than the Toyota. The actual difference is closer to two inches, maybe three. Not huge, but even two inches often could make the difference between people fitting comfortable and not. Starting once again with the spec sheets, the Honda Civic offers an inch more rear legroom than the Mazda. The actual difference seems larger. Another clear win for the Honda, especially compared to the Toyota. Focus on perceived roominess, and this Honda win becomes a rout. Although all of the cars are about equally wide, the Civic has a much wider cabin, especially up front. While the other two cars definitely feel like compacts from the driver seat, the Civic feels nearly as spacious as a midsize car. Here the spec sheet doesn't mislead: Honda claims three more inches of front shoulder room than Toyota does. Large grille. Too large? Fancy lights. The Corolla Hatchback also has less space than the others for cargo, though here again Toyota's specs folks might have own-goaled themselves. On paper, the Corolla has only about as much cargo capacity with its rear seat folded as the others do without their rear seats folded. In reality, there's definitely less space for cargo in the Corolla Hatchback, but not 50 percent less. Inside and out, the Corolla Hatchback is more artfully and tastefully styled than the typical recent Toyota. With the possible exception of the oversized grille, there are no "What were they thinking?" design choices. And there are some good ones. The car looks sporty. Honda took more risks with the styling of the Civic. Some work well, and some work badly. I especially dislike the fake "vents" in the rear bumper fascia. I hoped they'd remove these and some other extraneous, overdone exterior design elements with the 2019 mid-cycle update. Nope. A shame, because the Civic's styling is, like the work of some unhinged artists and authors, about 90 percent brilliant and 10 percent embarrasing. If only the Civic's designers had had a skillful editor. Then there's the Mazda3, which looks classier and more expensive than the other two cars before you open the door, and far classier and far more expensive that the other two once you do. I can find only a single nit to pick: per the current style, the grille is too large for a 168-horsepower car. The rest just looks better the longer you study it. Yet I'm somewhat concerned that the sedan might fail to stand out amongst other cars. Though its body sides include some sophsticated surfacing, the car's overall appearance could be overly subtle despite the grille. The hatchback has no such problem, though, and that's the one I'd personally get anyway. The Honda Civic has the most interesting interior styling, with a "high tech" vibe that manages to not go too far this generation. But its interior materials are if anything not quite as good as the Toyota's. In particular, the execution of the stitching embedded in the instrument panel is less convincing and the plastics seem more pervasive and more plasticky. Mazda's ability to include premium materials--upholstered surfaces with real stitching--inside a car priced in the 20s amazes me. If this is why the Mazda costs more than the Toyota, then it was money well spent. It might be $2,000 more, but it looks and feels like the interior of a car that costs at least $10,000 more. The Scion iM / Corolla iM was a decent car that looked sportier than it drove. To address this shortcoming for the Corolla Hatchback, Toyota bumped engine displacement from 1.8 to 2.0 liters and added direct injection. The result: a dramatic increase from 137 to 168 horsepower. The Corolla Hatchback borders on quick--just don't expect thrills. This said, the other two cars have more powerful, somewhat torquier, less buzzy engines--Mazda's thanks to more displacement (2.5 liters), Honda's thanks to a turbo (coupled with less displacement, 1.5 liters). Both are quicker. But you still better not expect thrills. For thrills, check out the Civic Si (sadly not offered as a hatchback) or, if you can find a dealer willing to sell you one at a price you can afford, the Civic Type R (offered only as a hatchback). Both are offered only with a manual transmission. The Type R is perhaps the most thrilling car I've driven in the past year. It's incredible. The new Mazda3 launches with pretty much the same 2.5-liter engine offered in the previous generation car. The 2.0-liter engine has been dropped, at least for now. In the future a revolutionary Skyactiv-X engine will be offered. In some scenarios this engine will employ compression ignition, like a diesel, but with gasoline, for significantly better performance and fuel economy. Auto makers have been trying to make compression ignition work with gasoline for decades. Mazda, which innovates more for its size than any other volume auto maker, figured out how to make it work with a combination of spark ignition and compression ignitiion. Unfortunately (or fortunately, if some kinks still need to be worked out) Europe and Japan will get the new engine before the U.S. does. I'm also hoping that Mazda will field a performance variant of the Mazda3 with the turbocharged 2.5-liter engine already offered in the Mazda6, CX-5, and CX-9. If you're not seeking thrills, only the sort of effortless around-town acceleration that an engine with a plump midrange can provide, the non-Si turbocharged Honda is the winner. Without turbos, the Toyota and Mazda engines must rev more in typical daily driving. Shift the focus to two-pedal transmissions, and the Mazda wins thanks to a very well tuned, responsive six-speed conventional automatic. Both the Toyota and the Honda employ CVTs, and while these behave less oddly than past CVTs they still have their moments, especially when pressed. In the Toyota you can opt to manually shift the transmission among ten set ratios using paddles next to the steering wheel or the shifter. In some trim levels of the Honda you can do the same with seven fixed ratios. Still, the Mazda's transmission is better. It's only shortcoming (aside from still being less engaging that a real manual transmission): six ratios is a bit behind the curve. The latest automatics have as many as ten ratios. 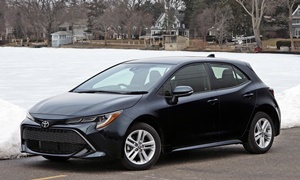 With a much stiffer body structure than the Scion iM, the Toyota Corolla Hatchback handles with considerably more control and precision than its predecessor, which itself handled better than the Corolla sedan. In fact, the Corolla Hatchback is the best-handling compact four-door Toyota in a long time. Somewhat numb, not especially quick steering detracts from the experience. But I enjoyed driving the car. Unfortunately, handling is yet another area where the Toyota performs well but the others perform better. The weak link with the Civic can be insufficiently grippy tires, but any of the sport trims addresses this. The Honda's steering feels the quickest of the three, lending the car a more agile feel. The Mazda...I'm going to need more seat time before I'm sure what I think about the new Mazda3's handling. My initial impression: it handles with the sort of control, poise, and refinement otherwise only found in the best premium sedans. The steering provides clear feedback and could hardly be more intuitive. You point the car where you want it to go, and it goes there precisely and effortlessly. But the new Mazda3 doesn't feel overtly sporty, and I wanted quicker responses. I felt more engaged via more granular feedback in the larger Mazda6 (which does set a high bar for a circa-3,300-pound front-wheel-drive sedan). A possible cause: unbeknownst to me, as this feature wasn't supposed to be available yet, the Mazda3 I borrowed from a dealer was fitted with all-wheel-drive (AWD). AWD can make a car feel so balanced and planted that it doesn't feel responsive. It certainly adds weight, about 175 lbs. Extra weight isn't good for agility. Mazda has tuned the AWD to work with selective brake applications to pivot the car into turns more quickly and smoothly then exit them with less drama. But between this and other tweaks, Mazda's engineers might have done too good a job refining even the smallest amounts of drama out of the chassis. Mazda made an unexpected engineering choice with the all-new platform: it replaced the previous multi-link suspension with a much simpler torsion beam. They claim that this made it possible to tune the car to handle better. I didn't detect any odd or unwelcome behavior due to this suspension. So while I'm skeptical whenever an auto maker claims that a cost-saving choice also improves the car's performance, I have no evidence to the contrary. All three cars manage to combine somewhat sporty handling with a liveable ride. While the Corolla Hatchback felt a touch firm over fairly small bumps, its suspension proved surprisingly compliant over larger ones. At around-town speeds noise levels seem fairly low, and they remain moderate even at highway speeds. But here as well Mazda has raised the bar. Thanks to a dramatic increase in refinement compared to its predecessor, the new Mazda3 has the quietest and most polished ride in the bunch. The Corolla Hatchback is the best small Toyota in a long time. Compared to the Corolla iM it replaces, it looks better, performs better, and handles better. It's even a little fun. It's also very afforable, packed with features, and should be very reliable. The problem is that while the Corolla Hatchback is very good, the Honda Civic and especially the new Mazda3 are better in nearly every way save price, fuel economy, and (probably) long-term reliability. The Honda looks and feels sportier, is quicker, and is much roomier. The new Mazda3 somehow delivers the style, interior materials, and refinement of a car that costs over $40,000 for well under $30,000. But if low cost and reliability are your top priorities, the Corolla Hatchback is the way to go, and you sacrifice far less than with previous Toyotas in return. Good performance, great fuel economy. Not much space for cargo, either. Toyota and Honda each provided insured cars for a week with a tank of gas. Sonya Harris of Subarban Mazda in Farmington Hills, MI, helpfully provided a Mazda3 for a test drive. She can be reached at 248-741-7807. 2019 Toyota Corolla Hatchback pros and cons, according to Michael Karesh: the best reasons for buying (or not buying) the 2019 Toyota Corolla Hatchback. Join TrueDelta to post your own impressions. I had a 2005 Mazdaspeed 3 and for under $25k, it was the most fun you could have with your pants on. I had a Corolla many, many years ago but I'll bet it's just more fun driving that Mazda 3. The instrument cluster on the SE looks like it could be from an old Yaris. Something you stare at all the time while driving should look nicer. And the LCD instrument cluster in the XSE washes out in the sun like the RAV4's.